As reported by Lloyd Alter at Treehugger, Broad Sustainable Buildings (BSB) has just completed the world’s tallest prefabricated building; a 57-storey tower in Changsha, China. The flatpack tower, which includes 800 apartments for BSB’s employees, was constructed at a staggering rate of three floors per day, and provides residents with 100% clean, fresh air to create a healthy environment amidst China’s smog. BSB’s modular flatpack towers represent a drive towards sustainability in Chinese construction that is led by BSB’s chairman Zhang Yue. With all the components of this ‘Mini Sky’ tower fabricated in factories and then moved to the construction site, there is little to no dust released in the building process. Moreover, BSB claims that had this one tower been built using conventional methods, it would have required an additional 15,000 truckloads of concrete. 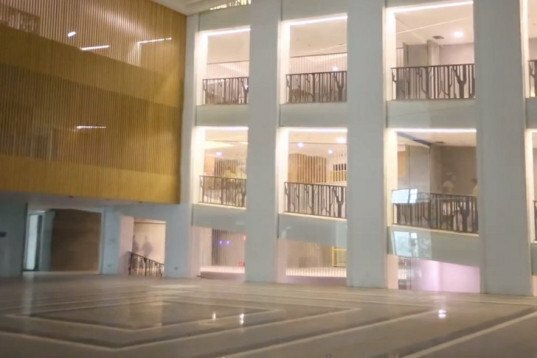 The building itself is as efficient as the construction methods—it features eight inches of insulation and quadruple paned windows. Power, heat and cooling systems are all integrated while, as Treehugger explains “with 3 stage air purification, particulates [are] reduced by 99.9%” with seven air changes per hour and 100% fresh air which is then run through heat recovery ventilators. The ‘Mini Sky’ tower is constructed around central atria, each three storeys (30ft) high and connected by ramps. The idea is that these areas form ‘sky streets’ to form communal spaces for anything from basketball games to vertical farms—moving residents away from elevators and towards a more traditional, collegial form of living. BSB has been working to build Sky City One, a 200 storey building that the company claims it can construct in 90 days—the project has been repeatedly halted, apparently for political reasons. This Mini Sky city, while proving that Zhang’s techniques work—and quite impressively so—was itself halted at 20 storeys and then cut in height from 97 storeys to 57; the company states that this was due to its location near an airport. There’s clearly work still to be done—politically and aesthetically—but it is, nonetheless a highly impressive feat. 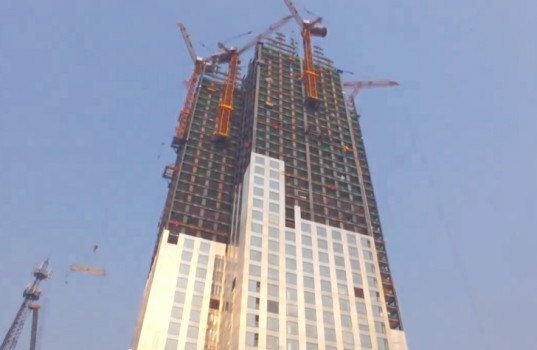 As reported by Lloyd Alter at Treehugger, Broad Sustainable Buildings (BSB) has just completed the world's tallest prefabricated building: a 57-storey tower in Changsha, China. The flatpack tower, which includes 800 apartments for BSB's employees, was constructed at a staggering rate of three floors per day, and provides residents with 100% clean, fresh air to create a healthy environment amidst China's smog. BSB's modular flatpack towers represent a drive towards sustainability in Chinese construction that is led by BSB's chairman Zhang Yue. With all the components of this 'Mini Sky' tower fabricated in factories and then moved to the construction site, there is little to no dust released in the building process. Moreover, BSB claims that had this one tower been built using conventional methods, it would have required an additional 15,000 truckloads of concrete. The building itself is as efficient as the construction methods—it features eight inches of insulation and quadruple paned windows. Power, heat and cooling systems are all integrated while, as Treehugger explains "with 3 stage air purification, particulates [are] reduced by 99.9%" with seven air changes per hour and 100% fresh air which is then run through heat recovery ventilators. The 'Mini Sky' tower is constructed around central atria, each three storeys (30ft) high and connected by ramps. The idea is that these areas form 'sky streets' to form communal spaces for anything from basketball games to vertical farms. This encourages residents to move away from elevators and towards a more traditional, collegial form of living. BSB has been working to build Sky City One, a 200 storey building that the company claims it can construct in 90 days—the project has been repeatedly halted, apparently for political reasons. This Mini Sky city, while proving that Zhang's techniques work—and quite impressively so—was itself halted at 20 storeys and then cut in height from 97 storeys to 57; the company states that this was due to its location near an airport.